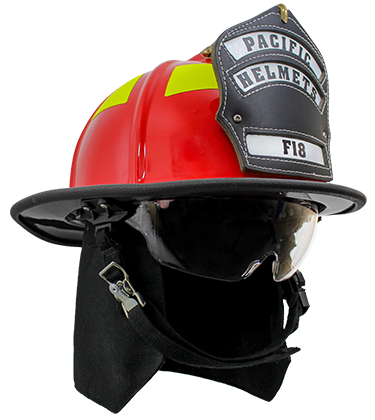 The Pacific F18 is the latest addition to the Pacific Range, a traditional style structural firefighting helmet with a modern interior. The Pacific F18 combines the latest interior designs from Pacific helmets with popular features from the traditional style. Pacific’s Generation 2 Liner is fitted to the F18 which optimises the feel of the helmet on your head. It comes with a 2 point chinstrap with Postman’s buckle to allow quick adjustment, and can be fitted with a leather front shield and holder. Contact your Pacific Helmets representative for more information and to design your F18. Fibreglass reinforced composite shell. Provides integral strength and excellent penetration protection. This lightweight shell is chemical and UV resistant with inherent heat and flame resistance. Expected service life of 15+ years with proper care and maintenance. Excellent thermal barrier. Unique crumple zone for superior shock absorption and internal air circulation.. Size 52–65cm (downsizing adjustment kits and XL sizes available). Simple operation with a single gloved hand. Comes with comfortable front and rear sweat padding in leather and is easily removable and replaceable for decontamination. Single handed adjustment for maximum comfort and stability. Available in Clear or Smoke Tint. Choose from Manual operation with pull tabs or the One Touch Eye Protector™. Choose from Black or Yellow Nomex®. Premium 3M™ 8887 Reflective Trim. Our range of standard colours can be seen here. Customs colours also available, MOQ may apply. The F18 is compatible with lighting solutions such as the Underwater Kinetics eLED and Adaro Adalit L5 Torches, and can be fitted with Titan Firecomms with helmet mounted boom microphone and speaker systems. Some accessories may require selected helmet features.